NORTH CHARLESTON, SC—Lamenting that his kin “just weren’t the same since” while responding to a question at Thursday’s undercard debate, Republican candidate Mike Huckabee decried Obamacare’s failure to help his slow-witted, cross-eyed cousin Chester who got kicked by a mule in early 2013. “He’s got a big ol’ crater in his forehead and warn’t able to ’member much, but dang nabbit, even Chester done know that Obamacare let him down,” said Huckabee, adding that the Affordable Care Act had been a whole peck a’ trouble for his cousin, who could purt near only recollect five or six words since his accident but was still “friendlier than a possum in a sack of cackleberries.” “If that don’t beat all, they still saw fit to send us a dad-burned bill for who-knows-what gubmint gobbledygook, even though Chester ain’t a lick better off than afore. 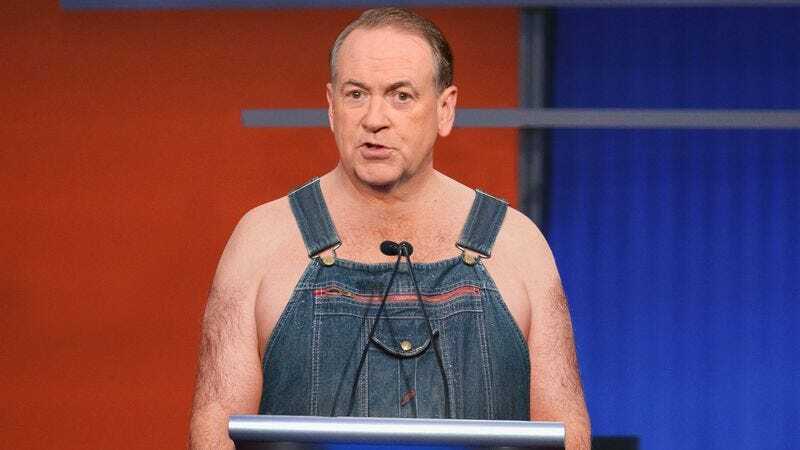 I’ll tell ya, when that Obamacare bill showed up, I was madder’n a wet hen.” At press time, Huckabee was criticizing the Obama administration’s disaster relief efforts for failing to save his Aunt Magda’s shack from being swallowed up by a mud hole.